Monday began with a briefing from council staff about the health care and wellness task force that the council convened this year. The task force identified some helpful information, such as: the expenses per person for health care in MCPS and the county are basically the same, the county in total insures about 100,000 lives, roughly 20% of the insured population accounts for 80% of the expenses (which mirrors national trends), and the only real way to save money in health care spending over the long term is to reduce the growth of total county spending per plan member. The council and particularly the Gov Ops committee will return early next year to this topic. We need to find better ways to manage the spending of what is nearly $500 million per year on health care benefits and we do not invest enough to do that job right. Monday evening I went to Clarksburg for a meeting with the Clarksburg Civic Association. We had a colorful and even contentious discussion over whether Clarksburg development has collapsed or not (I said it has, while some residents asserted that Clarksburg is booming; I believe the number of housing units that have been constructed in Clarksburg vs. the number approved supports my point), and talked about issues such as the proposed M-83 highway, sidewalks on 355, and so forth. Years ago, Montgomery County residents agreed to establish Clarksburg on certain terms, such as a development tax district that is higher than anywhere else in the county, in order to ensure that the new infrastructure in Clarksburg would be paid for by tax revenues generated in Clarksburg. Now, with rising energy costs and without the benefit of a real estate bubble, it is a question whether this model of development is fiscally sustainable. Today’s highlight was passing the Wheaton Sector Plan, a document that describes how we want development to proceed in the future, largely in the Wheaton central business district. I am very happy about the plan on several fronts, including the more aggressive approach to job growth that it embraces for the downtown, the environmental protections that it encourages including in the Westfield green buffer, and, particularly, the neighborhood protections that it codifies. I listened closely to advocates from the surrounding neighborhoods and urged the council to find solutions for reversing the dismal commercial developments that have encroached on their single family neighborhoods — truly, there is nothing more depressing than having a storage facility in your single family neighborhood. I was glad to see that Council staff and the PHED committee found a great solution by putting in guidance and a zoning formula that will hopefully result in those properties being redeveloped in a town home style, which would be much more compatible with the neighborhood. On Wednesday I attended Rail~Volution, a national conference about building better communities through transit. 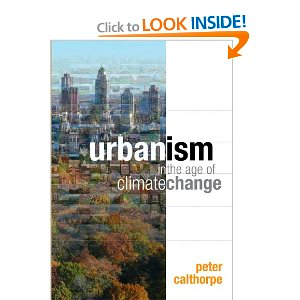 I saw a presentation by Peter Calthorpe that I will go ahead and say was the best presentation about planning and the environment that I have ever seen. We can see all around us now the evidence of a change in living patterns as people return to the cities and embrace/build the high quality of life that a great urban area can provide. Here in Montgomery County we have great suburban neighborhoods and a truly rare agricultural belt, but our urban districts are only starting to blossom. It is in these urban districts, served by public transportation, that we must focus our future job and housing growth. That will be the best way to keep our suburban and rural ways of life intact while fostering the job growth we need to pay for our government services and accommodating the population growth that we know is coming. And I would say most importantly, it is a necessary change if we are going to avert catastrophic climate change. I think we all know that we cannot continue to add cars to the road and vehicle miles traveled at the same rate in the next 50 years as we have in the last 50 years. We have to make a bold change. These concerns are what animates me in a lot of the daily battles that we have at the County Council. The council has a huge influence on land-use and transportation. Zoning, for example, is the intersection of community building, economic development, neighborhood preservation, environmental stewardship, transportation planning, and so many other key policy areas. It is NOT an eye-glazer! On a separate note, if you have been reading this blog you know that I have been working diligently to sustain the Fenton Street Market, a great example of grassroots economic development in the Silver Spring area. I am delighted to see this work get results as Hannah McCann and Megan Moriarty have announced they will work to keep the market going. There was a huge gap between the county and the market over use of public space in Silver Spring that we have been working to resolve. We are close now. If this works I hope to see similar efforts take root around the county. the areas in our communities with commercially-zoned property. county. We will return to those issues. restaurants, most or nearly all of which are desired by the community. places to live across the board. master plans with a one-size-fits-all zone, also not true. department will use to negotiate with developers as projects proceed. in shaping the future of land-use and development in this county.